PC power supply symtoms troubleshooting tips and tricks guide. If your computer will not start, meaning it seems like it is dead or partially dead, then you probably have a bad PC Power Supply. There are, of course, other components that can cause a no power issue, but usually we need to start at the source and check the power supply first. The power supply is at the rear of the PC, usually near the top of the case, and it is what gets plugged into the wall or power strip. If you open the case, you will notice the power supply is more complex inside. You will have a main power connector that is either a 20-pin or a 24-pin. 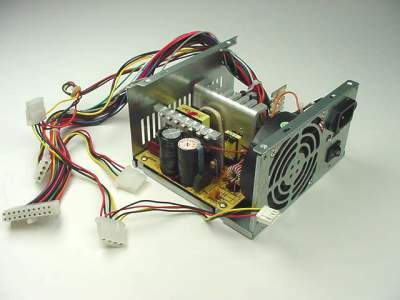 You will also have multiple connectors that go to various components in the case, like the hard drive, optical drives and sometimes even the video card. There are a couple of ways to test the power supply. The easiest is to purchase a cheap Power Supply Tester. You can also use a multimeter to check for proper voltages of 3.3, 5.5 and 12. You can also try running a jump from the PS_ON pin-the one with the green wire to a black ground lead. A paperclip can be used for this test. Power off the computer, disconnect the power supply from the wall outlet. Insert one end of the paperclip down into the space where the green wire attaches to the power supply plug. Do the same for the black wire using the other end of the paper clip. If the computer fires up, then you have a bad power supply. You can buy new power supplies straight from the manufacturer or go through your local computer repair shop. If you know exactly what type you need, you can purchase them online, as well. Finally, you will have to make the drive bays free so that you can successfully install the drives that you want in your case. Once you have settled on the right bays to use you will have to remove the metal plates and make working on the bays very easy and with that your atx cases will be ready for you to build your first PC. Check the power supply with a power supply tester. You can also use a multimeter. Jump the PS-ON lead to a ground wire. When it comes to PC Power Supply problems, the systoms can be tough to read. In fact, most users fail to recognize power related failures, attributing them to software glitches, sun spot act of God and the like. There are two aspects to consider here: problems from the electrical source (that is the line) and the problems within the hardware (power supply, UPS, surge protector). If you experience any of these problems, you probably need a UPS more than a surge suppressor. Suppressors, after all, only handle over-voltages. But under-voltages from excess power draw or sudden load increases need the active management that online UPSs can provide. With the exception of flickering lights, any of the symptoms just noted can also indicate a failing power supply. However, ther are few other telltale signs to look for.. If you note any of these symptoms, shut down the PC immediately-is time to buy a new power supply.